As much as I love pizza, tell me any pizza recipe that requires a rolling pin and I’ll probably respond with an eye roll. Tell me I have to let the dough rise for an hour after a long day of work and I’ll probably say, “Nope, not happening.” The truth is… an amateur chef with a full-time job can’t afford spending two hours on making her dinner! Are you looking for yummy and instant pizza recipes just like me? If yes, you have come to the right place. This recipe needs no kneading or rising time. You can make this pizza in less than the amount of time it would take for pizza delivery. Voilà, dinner is ready! Preheat oven to 210 degrees Celsius. Place defrosted sheet of puff pastry onto the parchment. Sauté chicken slightly, for 2min, under medium heat. Combine Teriyaki sauce ingredients in a bowl. Add the teriyaki sauce to the chicken, cook until the sauce is thickened and glossy, stirring occasionally, for around another 3 minutes. Remove the chicken from the sauce. Spread the teriyaki sauce onto the puff pastry, leaving a ½ ” border around the edges. Distribute chicken evenly over teriyaki sauce then top with shredded mozzarella. Bake for 15-20 minutes until the cheese is bubbly and just beginning to brown and the pastry crust is golden brown. Remove from oven and let cool for 2 minutes before sprinkling with chopped spring onions. “Life is a combination of magic and pasta.” – Federico Fellini. Life gets busy, but that doesn’t mean we need to compromise the taste of our meal as a result! This rich and decadent Dijon cream sauce is very easy to make and it pairs well with chicken, pork and even fish and can be used to create many other great dishes. Exactly what we need for a busy mid-week dinner! 1. Heat olive oil in a large frying pan over medium low heat. 2. Add chicken and garlic; fry the chicken until completely cooked. 3. Remove chicken from pan. 4. Add onion to pan, salute until they turn transparent. 5. Add the white wine to the pan. 6. Simmer until the volume is reduced by half, then add the whipping cream, mustard and chicken broth. 7. Simmer until sauce thickens enough to coat a spoon. 8. Return Chicken to the sauce, and simmer for an additional 1 minutes. 9. Serve over cooked linguine. Salt baked chicken is one of the most classic dishes in the Hakka repertoire. The dish is both clever and flavorful. Traditionally it is made by sealing the chicken with a tight cocoon of lotus leaf or parchment paper, which is then baked in scorching coarse salt. Despite the fact that the bird is packed solidly in a thick layer of coarse salt as it cooks, it doesn’t get unbearably salty because the salt doesn’t penetrate the wrapping. The salt coat mainly serves to retain heat and cook the bird evenly. Wash chicken wings, pat dry. Mix with marinade. Wrap the chicken wings with tin foil. Whisk the egg whites until foams form. Add salt and mix well. Line a French oven with tin foil. Spread a layer of salt mixture. Put in the chicken wing wrap and cover it with the remaining salt mixture. Bake the whole French oven for 30mins. Do not cover up the French oven while baking, otherwise the salt mixture cannot be dried, making the chicken very salty. Smash to remove the salt on the surface. Take out the chicken wings and serve! Soak the French oven with hot water until the salt melt before washing. Most probably the first thing that comes to your mind when you hear the word Normandy is the D-Day landing and the beaches where thousands of soldiers lost their lives during the Second World War. You may even recall images of Tom Hanks rescuing Matt Daman if you happen to have seen the blockbuster Saving Private Ryan like me. Normandy and Brittany of Northern France have always been on my travel bucket list- breathtaking views, beautiful villages, a great history… not to mention the great food…The lush green pastures of Normandy makes ideal grazing for dairy herds and cattle. No wonder it is often referred as the heartland of French dairy products; it is at the same time a major cider-producing region in France. “Fier d’ être français, et puis fier de ma region” – proud to be French, and then proud of my region, is a common French saying. That is also what I like about French food, each region bears its own distinctive cuisine, heavily influenced by the region’s history and culture, accomplished with pride using the finest local ingredients. 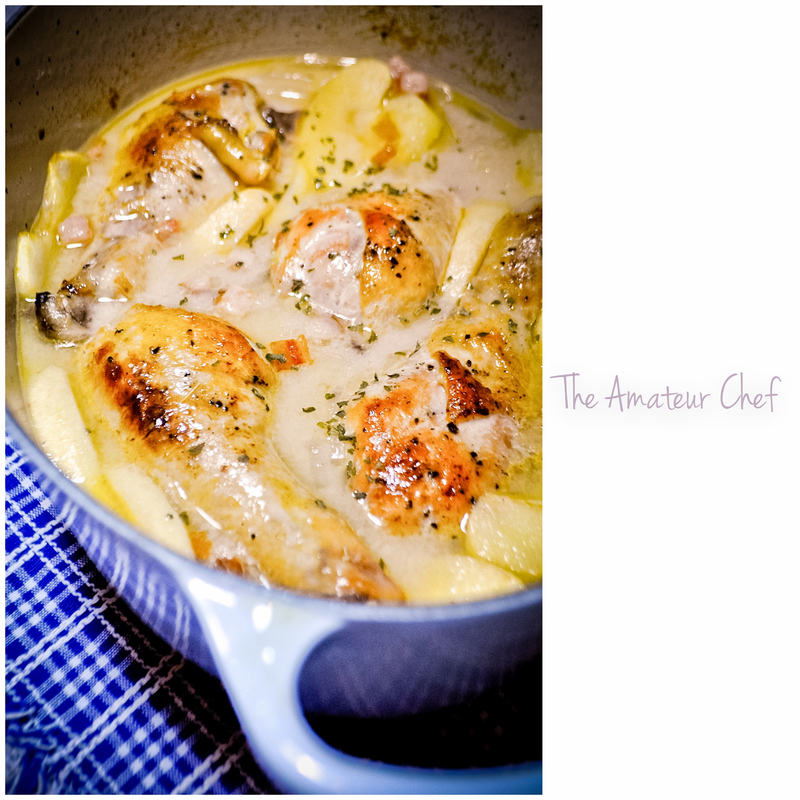 Poulet à la normande or Chicken Normandy is a dish you can never, ever go wrong with. 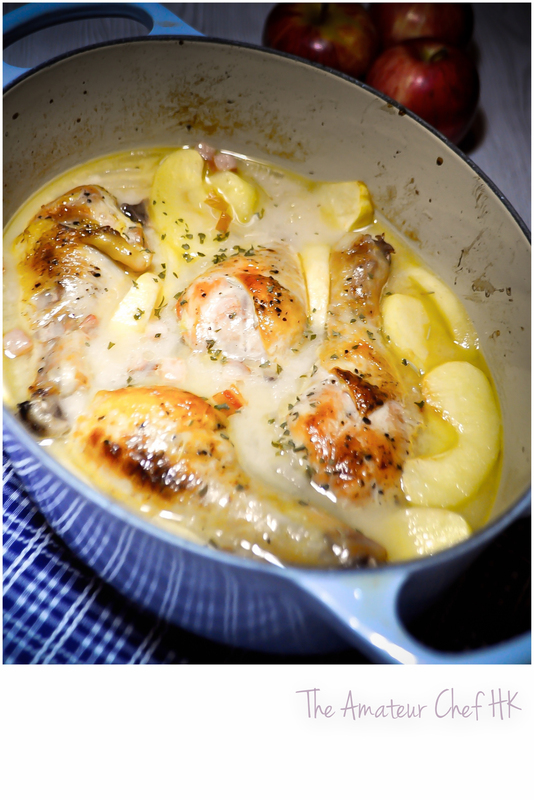 Made with Normandy’s famous produce- apple, cider and free range chicken, it is truly hearty and flavorful. As ordinary working class people, we don’t get to travel around the year. But “exotic” food always serves as solace to my wandering heart and helps me get through until my next vacation. 2. Heat the olive oil in a large frying pan. Add the bacon and cook for 3-4 minutes until brown. 3. Then add the onion and cook for 3-4 minutes until softened, then set aside. 4. Use the remaining oil to brown the chicken. Turn regularly, pressing down on each side. 5. Put the onion and bacon in a dutch oven, then put the chicken on top. 6. Add the cider and stock. Cover with lid and bake in the oven for 40 minutes. 8. Stir in the cream and sprinkle over the parsley.